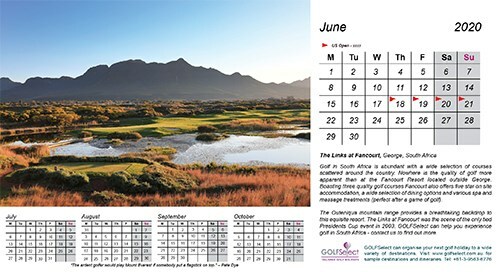 Only AUD$25.00. 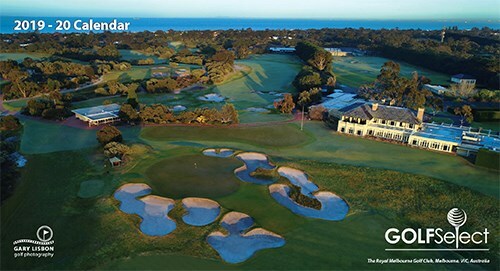 Free Delivery within Australia! 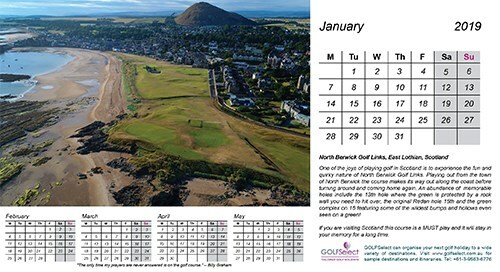 Each year Gary produces an 18 month desktop calendar featuring his spectacular images from the best golf courses around the world including Australia, Mexico, New Zealand, Scotland, Northern Ireland, Vietnam and Japan. 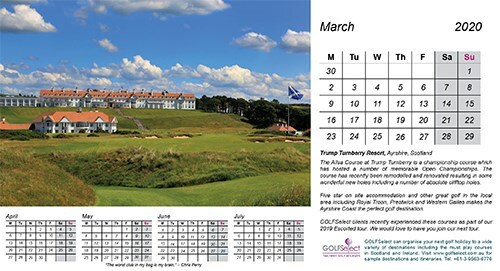 The 2019/20 calendar is now available for purchase with immediate delivery and features some amazing images from the best of golf around the world. 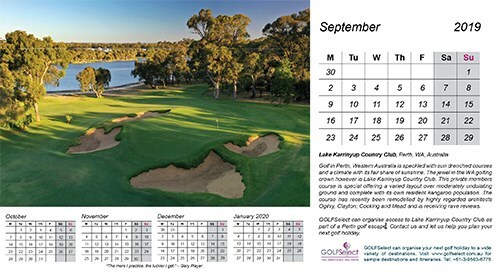 The calendar covers the period of January 2019 to June 2020 (18 months) and is available for a purchase price of AUD$25.00 including delivery in Australia. It is an ideal desk companion. 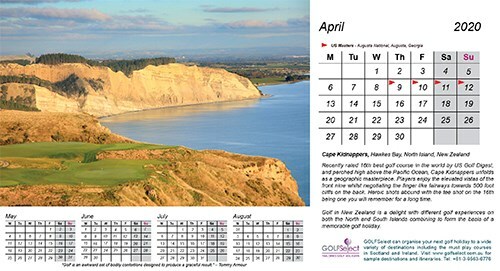 In addition to monthly pages featuring one of Gary's spectacular images there is also a handy 4 month date preview at the bottom of each page. 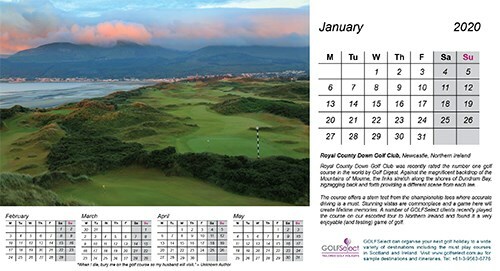 The calendar also features a 12 month calendar for 2019 on a single page - making it an ideal reference guide. 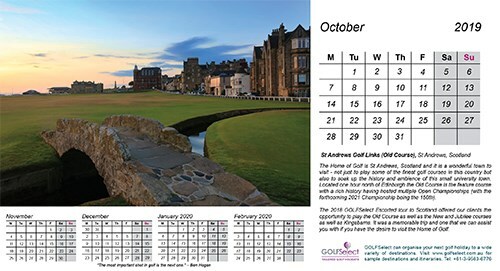 Furthermore we have added the dates of all golf majors into the calendar as well as a number of funny golf quotes to help you get through each month. This payment gateway is 100% secure and once you push the "Proceed to Secure Server" button you will be taken to a secure area for the entering of your credit card details. GOLFSelect does NOT have access to your credit card information. Please check your order. The total amount must be greater than $0. 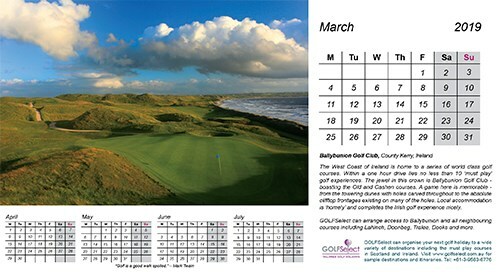 Try this page again to see if the problem has been resolved.